I'm one of the lucky ones who have not yet started school. I know this may be late for a few people, but for those of you who haven't returned to school, here are my top 10 things I do before the students arrive for open house night. How can you begin if you don't know which students have moved in or out of district, to another school or who are coming into kindergarten with an IEP? This is my third year at my current school and 4th year in the district, so I know how to access who new or gone from my caseload. 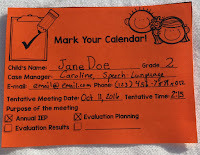 -Ask the special ed teachers which of there students have speech on their IEP. -Talk to your building's special ed coordinator or secretary. They most likely have a list. -Access a list of the students in your building on IEPs and check their IEPs for service minutes for speech/language. -Ask the teachers who in their class last year had speech. None of these are fool proof. 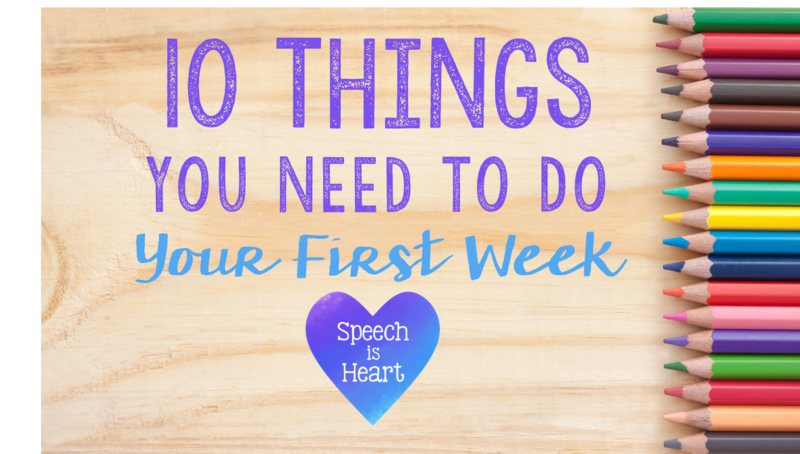 I've had students move in midway through the year and after they've been at the school for a couple weeks, someone lets me know that they have an IEP with speech services. I've also been in the position where a student was accidentally marked "inactive" in our system and they missed a week of service. If this happens, do your best to make up the service times missed and to set up a new system for incoming students. Introduce yourself to the families. Hopefully you have met many of the teachers during workshop week. For students I case manage, I call the families and let them know that I will be the case manager and how they can contact me. 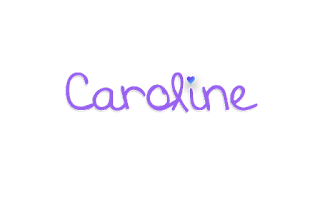 For all families, I write a welcome letter introducing myself. In the letter I include my title, my service schedule (I use the 3:1 model, so I describe this), and a small picture of myself. I make sure to have a packet for every student that they receive at open house night from their teacher. 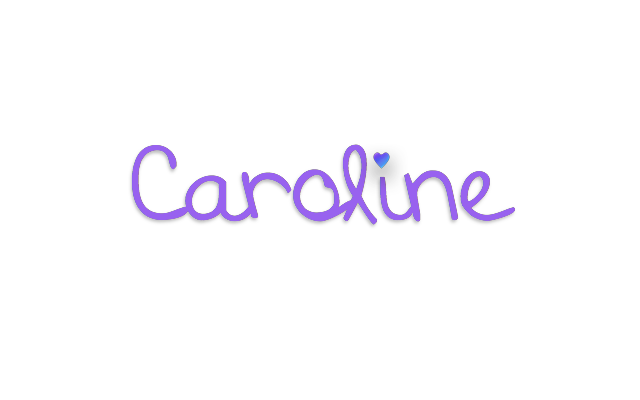 Type of service: language, artic, social skills, phonology, etc. While I'm making the file reviews, I make a list of students with artic goals, a list of students with language goals, and a list of students with social skills goals. This helps me group these students more easily by similar goals. Look at the IEPs of your students and find which ones are due for re-evaluation. In Minnesota, we re-evaluate every 3 years, so I make a list of students who need to be re-evaluated during the school year and keep it in my planner. 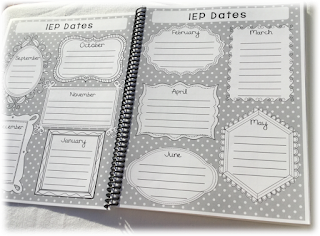 I keep track of which students need IEPs for each month of the school year in my SLP Planner with Psalms. This comes in very handy. On the first of every month, I double check this list to make sure I have planned all the meetings needed for that month. Don't panic! I'm not telling you to schedule all your IEPs for September. I make a list of students I case manage and look at when their IEP needs to be scheduled. For IEPs, they must be held within 1 year of the last IEP date. I typically like to schedule the meeting as close to that date as possible. I look at each month and for which students I will need to hold a meeting. I then create a tentative date that I pencil in my calendar. 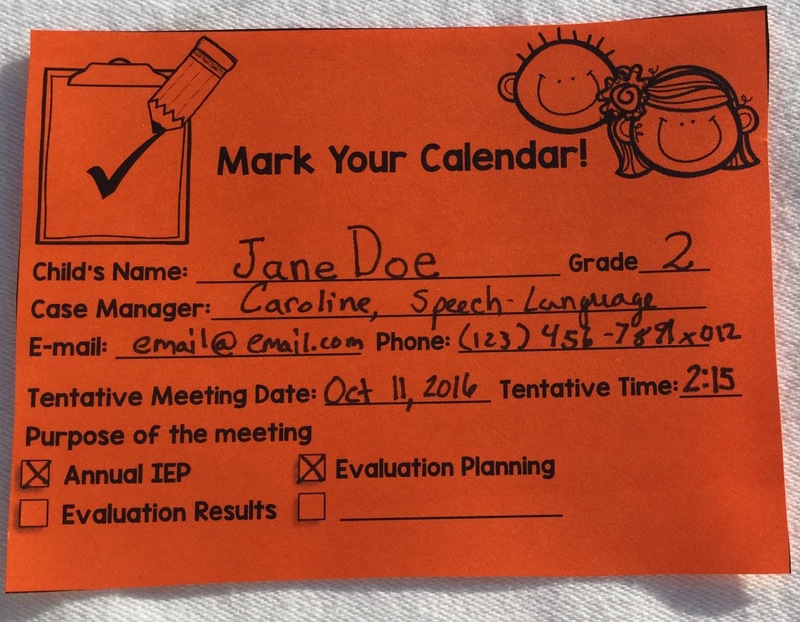 One month before that date, I pencil in "Schedule *student's* IEP" into my calendar to make sure I touch base with parents and teachers and ensure that I have availability for this meeting. I use my planner's IEP pages to write in tentative dates for each month. I also send home IEP "save the dates" on brightly colored paper. Many parents have to work and need advanced notice of when to take a day off or when they need to leave earlier. To make my job easier, I send home these save the dates. 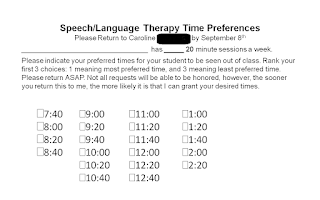 I talk to teachers or give them a form to list times when students can be pulled from their class. On the right is an example form of what I have used before. I have also used forms where teachers list increments of 30 minutes when I can pull their students. I really love having a copy of their times so that if when my schedule needs to be re-worked, I can refer to their preferred times. This is honestly a love-hate relationship for me. I love making my first schedule. I hate having to adjust it on a weekly or even daily basis when things change. 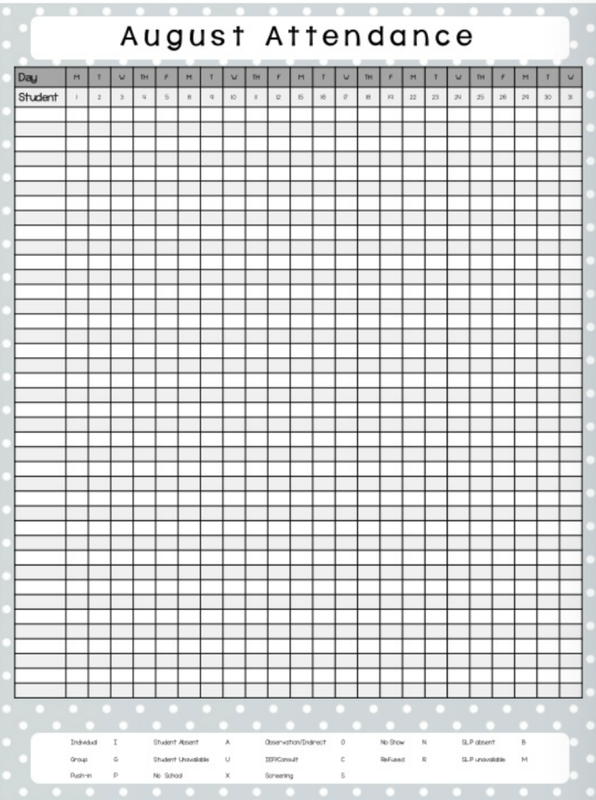 Check out this post on how I use excel to schedule students. I try not to waste paper by printing off each IEP and carrying it around when I'm planning lessons. Instead, I make a cheat sheet that contains all of my students and a brief list of what their goals are. Johnny will produce /k/, /g/, and "ng" in isolation with 80% accuracy across 3 sessions as measured by speech language pathologist data collection. Johnny will produce /k/, /g/, and "ng" at the word level in all word positions with 80% accuracy across 3 sessions as measured by speech language pathologist data collection. This way I can usually fit all my students and their goals onto a front and back piece of paper. When it comes time to lesson planning, I use this sheet to help make sure I am targeting each goal on their IEPs. 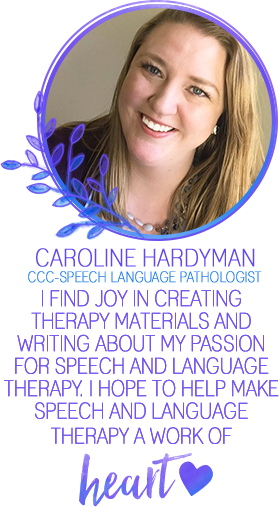 Each SLP has a different way to do this. 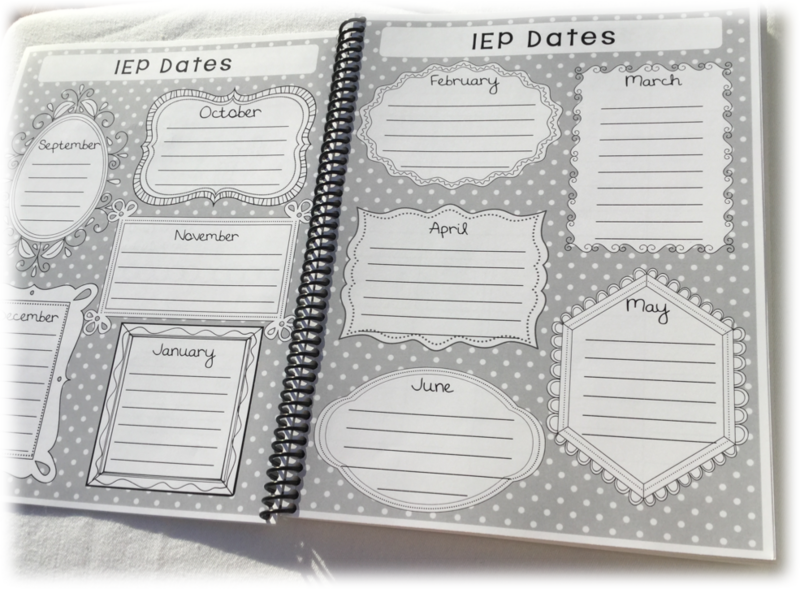 In the past, I've created a folder for each student that contains their IEP goal sheet and any materials they might use throughout the year. Materials include worksheets, start of the year activities, and their data collection sheet. I use progress monitoring, such as Natalie Snyder's progress monitoring tools or 5 minute Kids for articulation. This lets me compare a baseline to where they are at the time of their IEP and the end of the year. I also track attendance in my planner. This way I can list all my students and keep track of when they were absent, on a field trip, seen individual or in groups, etc... Instead of a separate sheet for each student, I use address labels to collect data. I initially got the idea from Queen's Speech. You can find her original post here. In each student's folder is a sheet where I place these labels at the end of a session. No matter how you prepare for the school, remember that you are an awesome speech language pathologist (or other educator) and that YOU make a difference in your students' lives. God's richest blessings on your year!